Get Cozy when there is a Chill in the air! A great way to extend the season outdoors is with an outdoor fire pit. You can either build one or purchase one. Outdoor fireplaces are great too. We love spending time in our backyard. We have improved our backyard so much over the past few years that it has become a favorite place to relax. You will feel the same way when your personalize your space to felext your style, add a firepit to your property and start enjoying it now! Relaxing by a roaring fire of a firepit is wonderful. It is alot like having a campfire. And we love to go camping to relax, so relaxing by the fire pit is perfect for us. 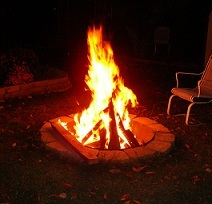 I am including more photos of our in ground firepit with a fire burning at night. See photos below. We have had this outdoor fire pit for about 3 years. It is a wonderful place to gather around with friends and family. Or my husband and I use it to roast hotdogs when it just the 2 of us. And you have to have comfortableoutdoor chairs to place around your fire pit, or outdoor fireplace. Check out the chairs at Adirondack Chairs below. Always know what the forecast is for your firepit party! 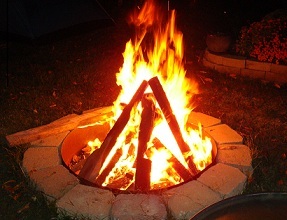 You can build an in ground backyard fire pit like the one shown here. Determine the exact style of the pit depending on the location of it, in your backyard. Ours is located alone in an area of our backyard. We can surround it with chairs placed as needed. We have a patio right off of our house and may decide to relocate it there. At the time we built ours we had a pond where the fire pit would have gone. We have removed the pond and are still determining how we will finish the space. Right now it is a flower garden filled with annual flowers , but it is evolving into alot more as we join two outdoor rooms together. So if you place your outdoor firepit in a location that proves to not be the best fit. It can be moved. Just fill with dirt in the hole and plant grass seed . Or turn the area into a garden. Make sure you know the final destination before your surround the pit with pavers or stones. Our pit is surrounded by grass, but a circle made from natural stone or paver stones surrounding the fire pit is a nice finishing touch. If we move it, it will be surrrounded by a natural stone circle to match the patio we have in our secret garden. You can even add built-in seating. There are lots of options. During warmer months when you know you won't be using it as a firepit, place assorted planters filled with flowers inside for an instant garden. Then you just remove the planters when you decide to build a fire or grill food. To build a firepit like the one you see on this page you will need to dig a 12 inch deep hole in the desired location for the pit. We used 2 layers of large wall pavers in a round pattern. The bottom layer is completely hidden. The top layer of wall stones sticks up out of the ground a few inches. You can adjust this if you want. Determine the size you want the opening to be. Ours is approximately 36 inches on the inside. With the outside stones the outside measurement is about a 5 feet circle. 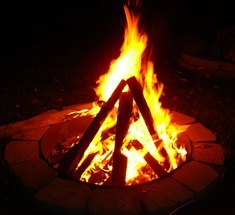 Depending on the materials you use to surround your outdoor firepit, you could alter the shape. We purchased these wall stones at a local landscape center. They were left over and on clearance. So we got a great deal on them. Check your local suppliers you may find a deal on some left over stones at the end of the season. Or checkon Craigslist, you can find some great deals there too. Dig the hole about 12 inches deep. Place the wall stone around the outside edges. Have a metal ring manufactured at a sheet metal fabrication shop. 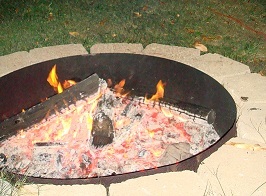 The metal ring is required between the stone and the fire for safety. Fill the hole with a few inches of loose gravel or stones. We used white stones that match our landscape. The wood burns up during the fire so there is no need to clean out the pit. Practice safety when using the firepit around pets and children. Enjoy your new heat source and spend more time in your backyard enjoying your surroundings. You can also use a firepit like is as a charcoal grill. 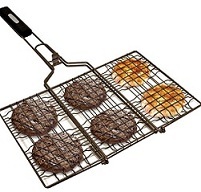 Purchase a metal grill stand at one of the online stores featured on this page. Then add charcoal in the bottom of the firepit instead of wood. You could cook all day! Lots of yummy burgers, dogs, chops, chicken and more. Even fix a kettle of chili or beans. Great for entertaining a large crowd as a grill too! There are lots of possibilities with a pit like this. Go to the bottom of this page to see several great fire pit accessories for roasting chicken, pork, popping popcorn, cooking with cast iron cookware and more. After you improve your home and garden with the ideas on this site such as this project, make sure you take time to really ENJOY your home and garden too. We all need to slow down a little and enjoy our surroundings more. Check out the Backyard Living Store below to find Outdoor Furniture, Grills, Fire Pits and More! If you decide you prefer an above ground free standing backyard fire pit or fireplace for more flexibility, then shop at the links I have added to this page and other outdoor pages through out this website. There are plenty to choose from on the links provided. Our backyard Living store has lots of outdoor goodies. If you have any questions, or need assistance just use the invitation provided. I am here, let me help you. The invitation below is your opportunity to ask questions or tell us your story about a fire pit you have added to your backyard. Provide photos too. I will feature your story on this website. Shop at the stores featured on this site for everything you need to finish your backyard projects. There are more links below the invitation. The Landmann Round Rock Fire Pit & Grill features exceptional heavy-duty construction and size. Using wood or charcoal iIt can barbecue just about anything with its large grilling surface. Available in 36- or 48-inch diameter. Cooking over an open fire has never been easier! This rotisserie allows you to cook chickens, roasts, or anything your stomach desires. The Grizzly Spit is perfect for camping, hunting, fishing, boating; or even in the backyard. 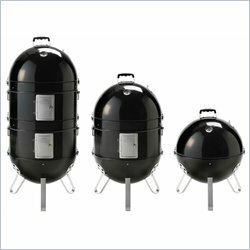 This rotisserie can be used with a barbeque grill, open fire pit, or over a bed of charcoal. Even works in snow or on the beach! The Camp Chef® Classic Dutch Oven helps you prepare delicious meals with the hearty flavor that can only be achieved with cast iron cookware. This classic-style Dutch oven features a beautiful whitetail deer etching on the lid and is equipped with 3 legs, a handled lid, and bale. The raised lip around the lid is excellent for cooking with charcoal briquettes or wood. Comes pre-seasoned and ready to cook. 6-qt. capacity. Enjoy a special treat on your next camping adventure or in your backyard at your firepit. It will make neighbors or fellow campers envious when they catch a whiff of fresh popcorn popping. This kit includes a Whirley Pop openfire Popcorn Popper with air vents to allow moisture to escape, resulting in a delicious crunchy texture. The comfort grip handle extends two feet for safe campfire cooking. Also included is a theater popping kit with everything needed to make 4 quarts of popcorn. Click on the popcorn popper below for full details. Their overall length of 30" makes the pie irons great for campfires and indoor or outdoor fireplaces. Each is crafted of heavy duty cast iron for maximum heat retention. GRILL Welded of high quality steel to go over a campfire or fire pit. Legs fold underneath for compact storage. Size 36" x 18". Holds your cookware over the open fire. Have A Great Story About a Firepit? Or do you have a question? Do you have a great story about this? Share it! OR if you have a question about a firepit you are shopping for , just ask me. I will answer your question and post the answer on this website.